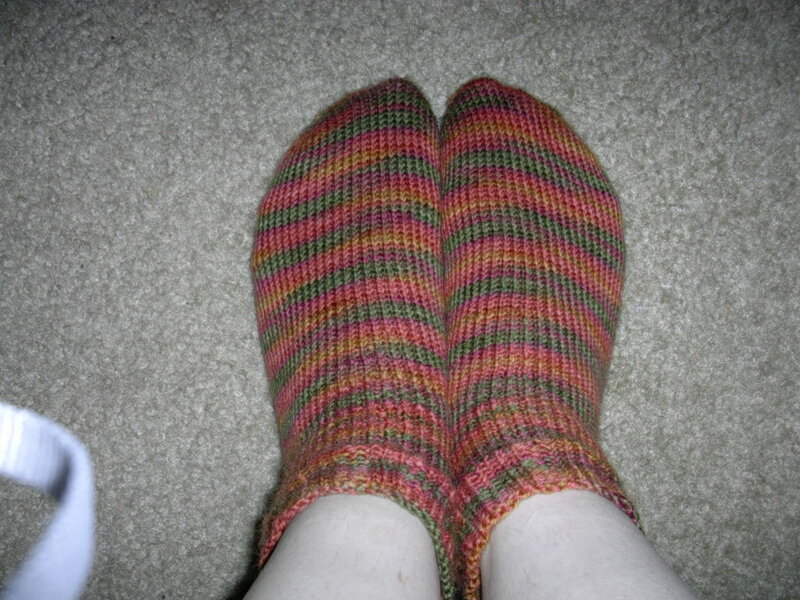 So I finished the Green Gable. Well... it looks like Green Gable, but is it really? After changing gauge, all of the pattern repeat numbers, adding way more shaping, making it longer and smaller... 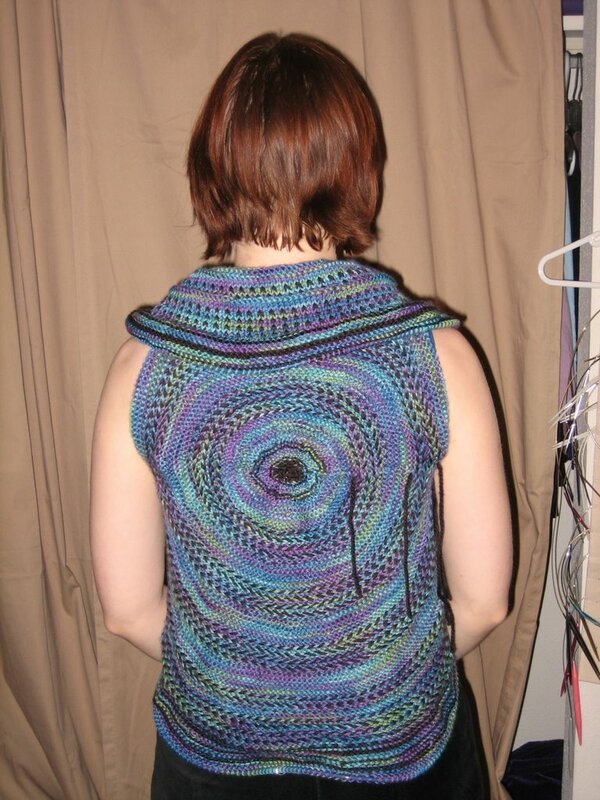 I guess I learned to make a top down raglan in the process which is all Green Gable really is so it was definitely worth my $5 or whatever the pattern cost. I was really hoping to blog today. 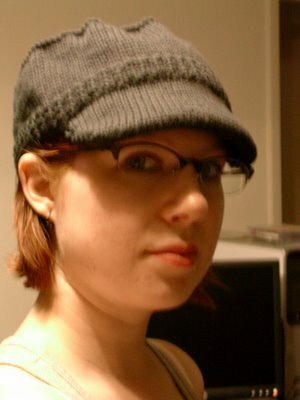 I was all ready to be a good knitblogger and give full specs for my stuff. And I had funny stories from my life of situations. I'm now a rat respiratory therapist and there was wedding planning gossip too. But later maybe. I just don't feel that funny anymore. 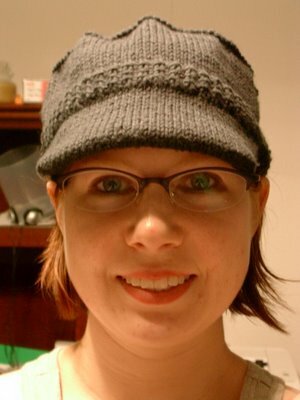 I've been wanting to make the Topi hat from Knitty since it came out but I didn't have the right yarn for it. Well KnitPicks came to the rescue... I started this hat yesterday and finished it today (with some other knitting in between). 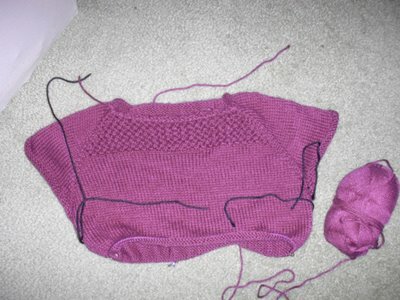 Notes- I knit the medium size since my gauge was a bit tighter than I think the pattern called for. 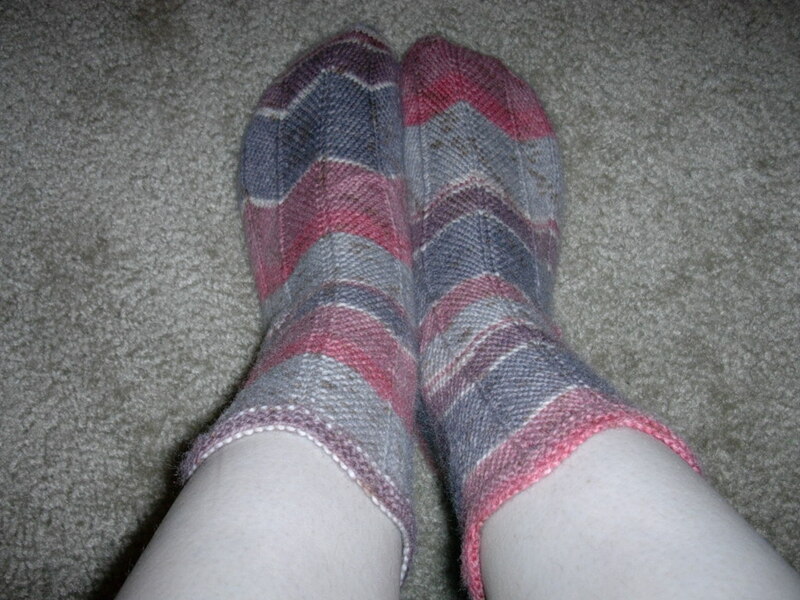 It is a little loose but the whole time I was knitting it I swore it was going to be too small. Trust your measurements (head circumference/pi = diameter). 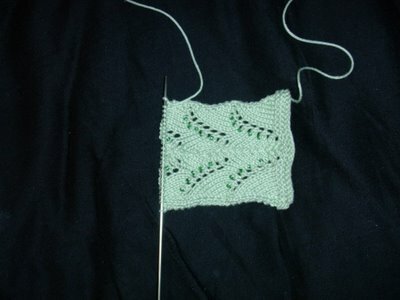 I chose to do the bill on the smaller needles since I wanted the fabric to be stiffer. I haven't inserted any plastic to keep it up and it is doing fine. Well it has been a while since I updated. Since then I went on a week long trip to Amsterdam with David. I am excited to report that we got engaged and it that was so swelteringly hot he had to stick my knuckle in his mouth so that the ring would slide onto my finger. 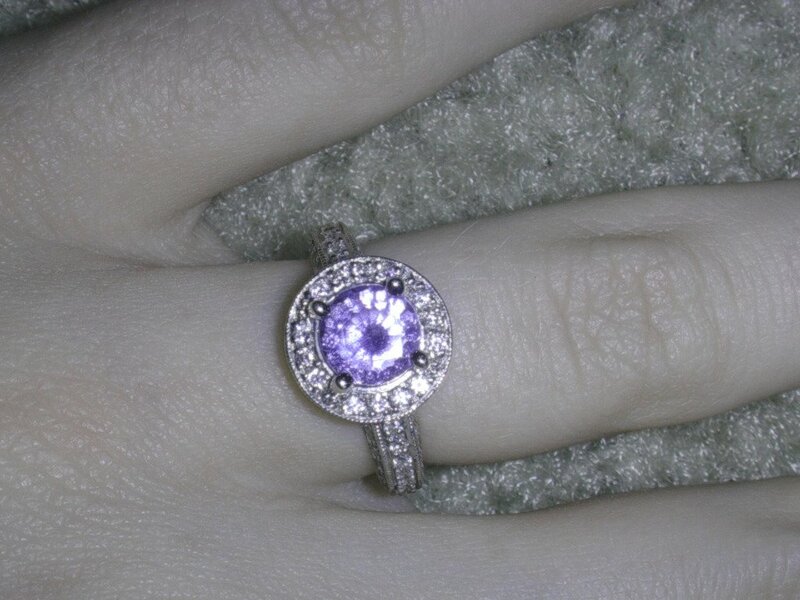 We've been together for almost 3 and a half years now and I was so very happy to say yes to him. The ring (though a bit dirty right now) is a purple sapphire that I absolutely love (and I picked out). 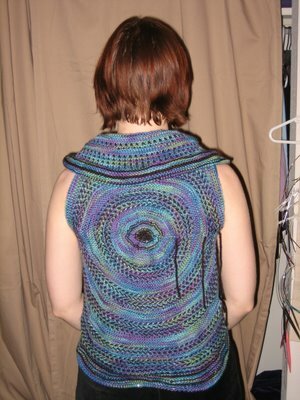 I knitted on my twisted float shrug quite a bit on vacation but I haven't touched it in a couple of weeks. Here is the progress, I'm almost done with the body. I've been cheating on it with Green Gable. 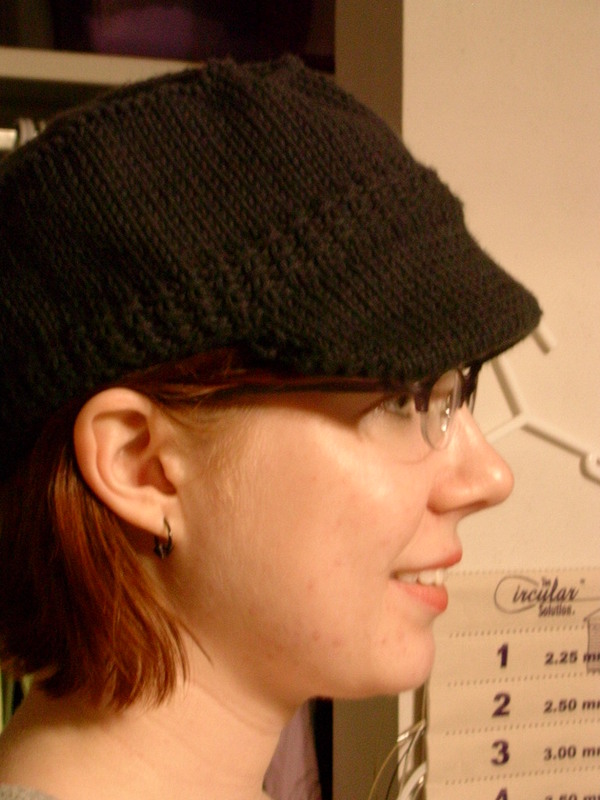 A heavily modified green gable with way more stitches per inch and the accompanying increases in the number of stitches. 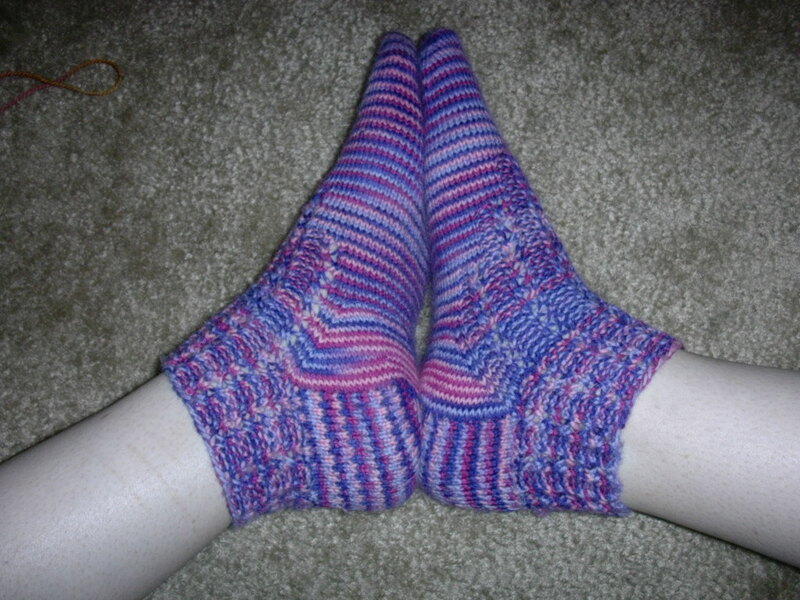 This is Lilac Elegance from Knitpicks. I also started a Perdita cuff from Knitty using Paton's Grace (which I don't like). This is my first beaded project. 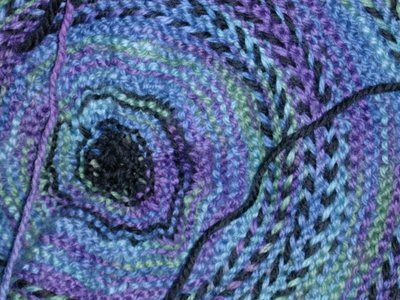 The twisted float shrug is getting bigger - I've finished my third pattern repeat now and I have inserted the waste yarn for the sleeves. The shrug is all scrunched on the needles right now so there is no point in photographing the yarn lump. The braided cable sock was 90% complete and then frogged, too long yet too narrow. I was in denial for about half of the sock and yet I knitted on. Oh well. 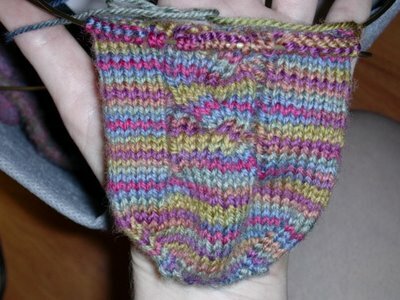 I started it again and I decided to knit just a plain stockinette sock. I have about 800 yards of Schaefer Laurel in Billie Holiday. It is a gorgeous shiny cotton yarn. The start of the Twisted Float Shrug and... MORE Socks! I started the famous Twisted Float Shrug from Vogue Winter 2005. 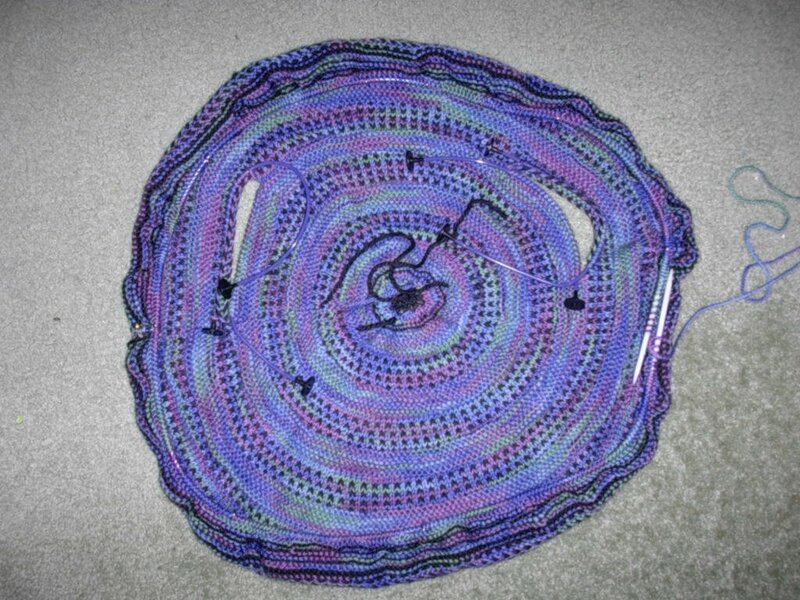 I'm doing it in Lorna's Laces with Lakeview and Charcoal as the main colors and Blackberry Grace for the edging. 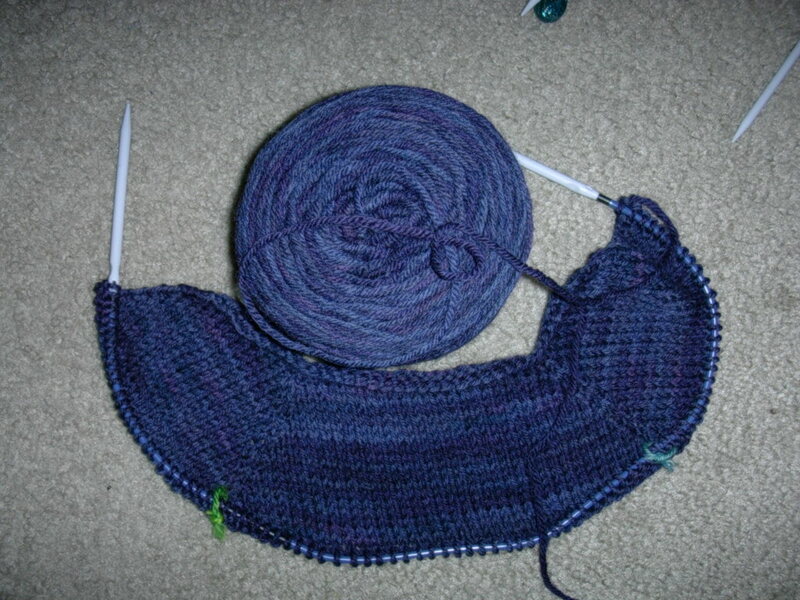 It has grown to about 12" in diameter but it is a little scrunched as you see it here on the needles. I'm two pattern repeats into it. A better view of the colors - but still not quite right. The colors are fab in person. 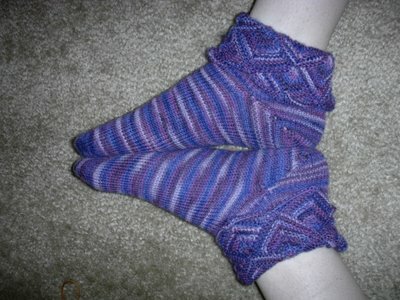 Then there is this pair - an anklet version of Knitty's Cut Your Teeth Socks in Lorna's Laces Shepherd Sock Purple Club. 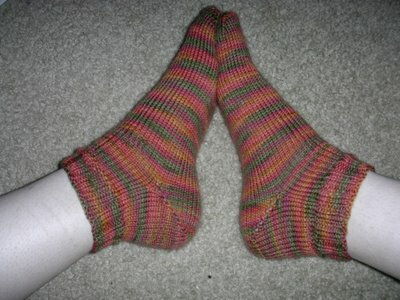 Then I knitted the famous Jaywalker pattern in Austermann Step yarn - it is nice but not everything I hoped. 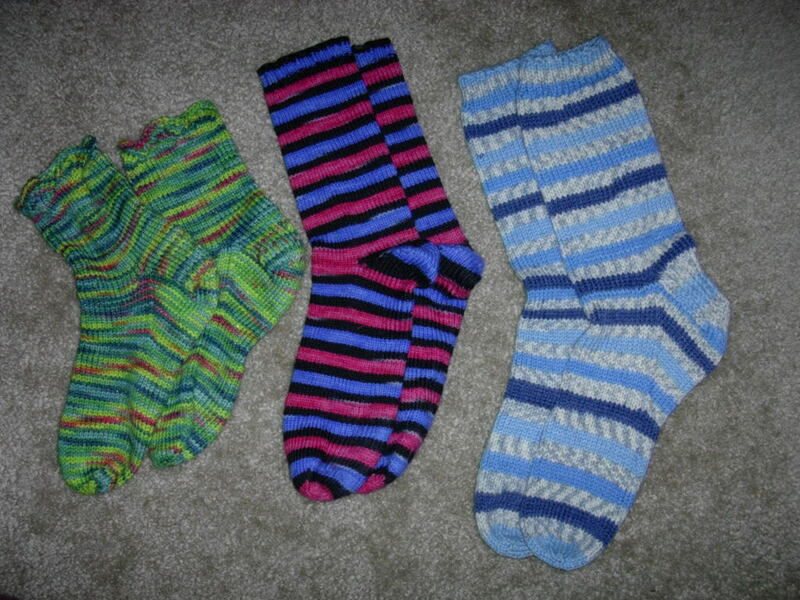 The non-matchingness was on purpose I had a ton of yarn left over, I think I got the unmatched stripes out of my system though and will probably stripe match from now on. 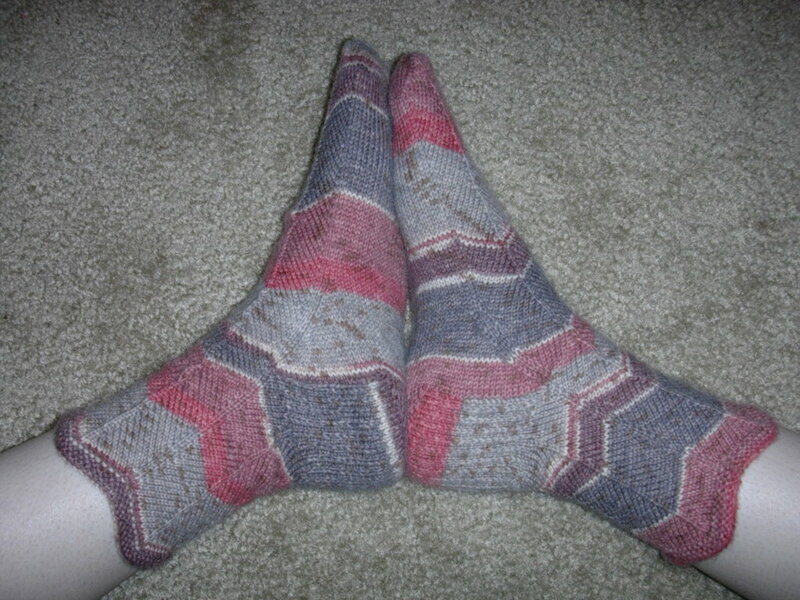 I wanted a quick fun to wear pair of socks and these are now my favorite socks! Comfort, comfort, comfort - it is hot down here in Florida and these socks are so soft and squishy without being too hot. It is Lorna's Laces Shepherd Sport in Gold Hill - I was unsure how I would feel about this weight of yarn that I got at the Littleknits.com sale but I love it. I usually feel a little bit of the stitches even with skinny needles but these beauties were knit on size 2s and I don't feel the stitches one bit. 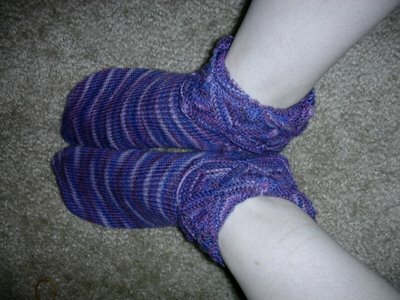 As a side project when I'm sick of those annoying twisted floats I started working on these simple socks in LL Shepherd Sport in Watercolor. Just a nice braided cable for interest. 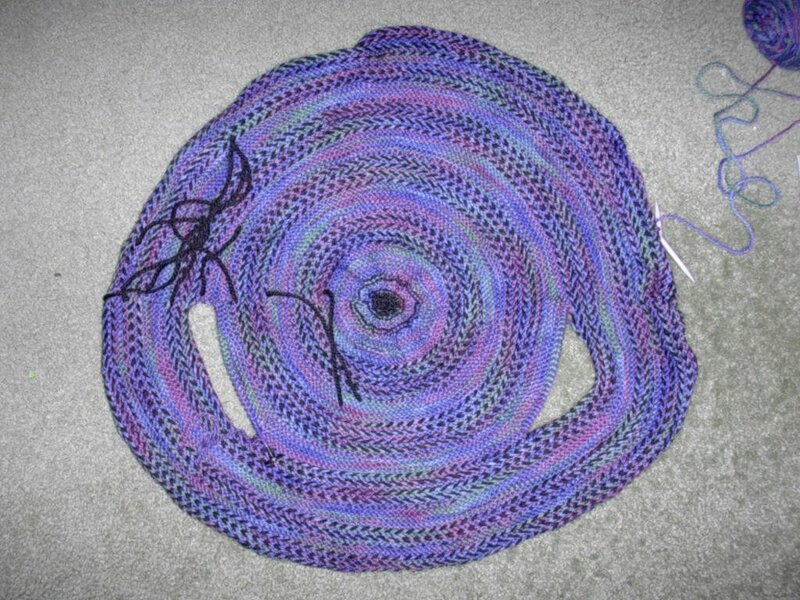 And that's what I'm up to this summer - Netflix, knitting and cooking, what could be better? 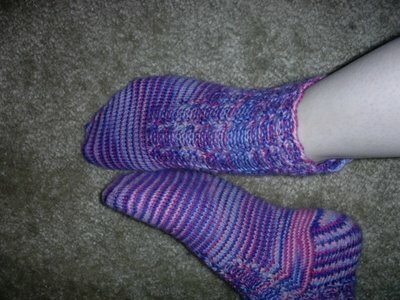 I have loved the Cherry Tree Hill yarns I've purchased before, Super Sock Potluck and Super Glitz varieties. 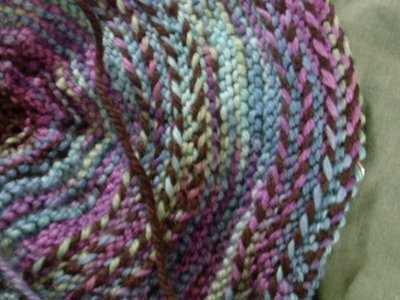 So I decided to branch out and try their worsted wool potluck. This is a one skein wonder in progress. 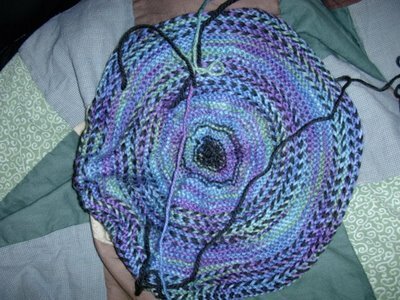 The yarn is exactly like the Lion Brand Fisherman's Wool I dyed with grape Kool-Aid some time ago. Except this cost me $12. 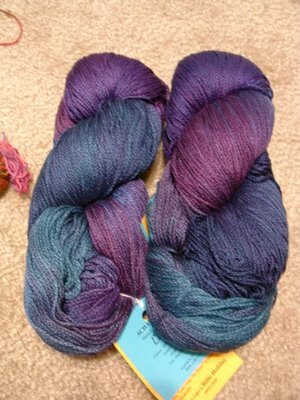 I was expecting the kind of rich beautiful variegated colors I got in my Super Sock Potluck skeins - this looks like one color was used and in some areas it absorbed more or less creating the color variation. It is kind of ugly but I like purple and I love the long sleeved one skein wonder so I'll definitely wear it.